This is an easy cut and paste paper craft for young children to assemble during the summer. It has a pair of leaves and a pair of bumblebees. 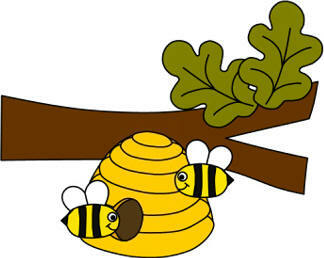 The leaves and the bees are both "mirror images" of each other -- in other words, they are identical just "flipped". This can lead to a fun discussion about how reflections in the mirror look "reversed" or "flipped" (ask the children to hold something up in the mirror and ask them to describe what they notice about it). For children who can recognize their letters, a handwritten "B" or their name printed out would work well as the "reversed image" effect is very obvious when you hold printing up to a mirror. The craft also works well for a "B is for Branch/B is for Bumblebee" alphabet lesson. Color the template pieces if using the black and white version of the craft. Note: The children might not assemble the project exactly the way I envisioned it. That's ok!! Let them put the pieces together in whatever way inspires them. Optional: If using a blue background, you can decorate further with cotton ball clouds and a few more hand drawn bumblebees.